Wash the vegetables. Peel and "julienne" the carrots. Remove the stem and seeds then also "julienne" the bell pepper. Zucchini are cut into thin slices. In a skillet or wok with very little oil at the bottom (just enough so that the vegetables don’t stick) add the carrots and cook them over medium heat. Stir. After 5', add the bell pepper. Stir occasionally and after about 5’, add the zucchini. Stir everything regularly and leave over the heat to cook for about 10 to 15' more. Rinse for 30 seconds with cold water, then put the noodles for 2’ in boiling water (you should have previously set water to heat in a pan or stewpot). Remove and drain. 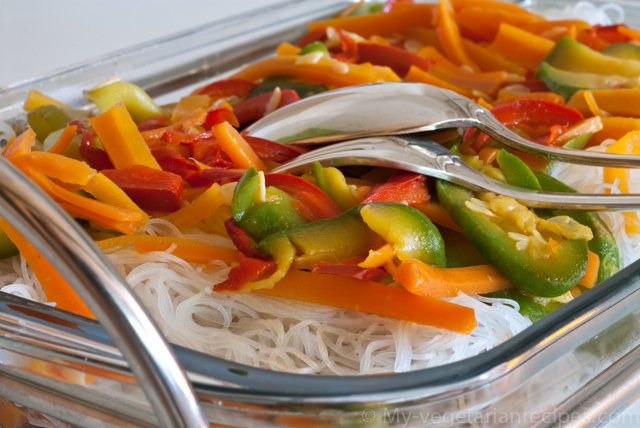 Take a dish for serving, pour some soy sauce at the bottom (add a "touch" of curry paste or some other spices of your choice if you want), add one half of the vegetables, cover with the rice noodles and then add on top the other half of the vegetables. The dish is ready to be enjoyed!